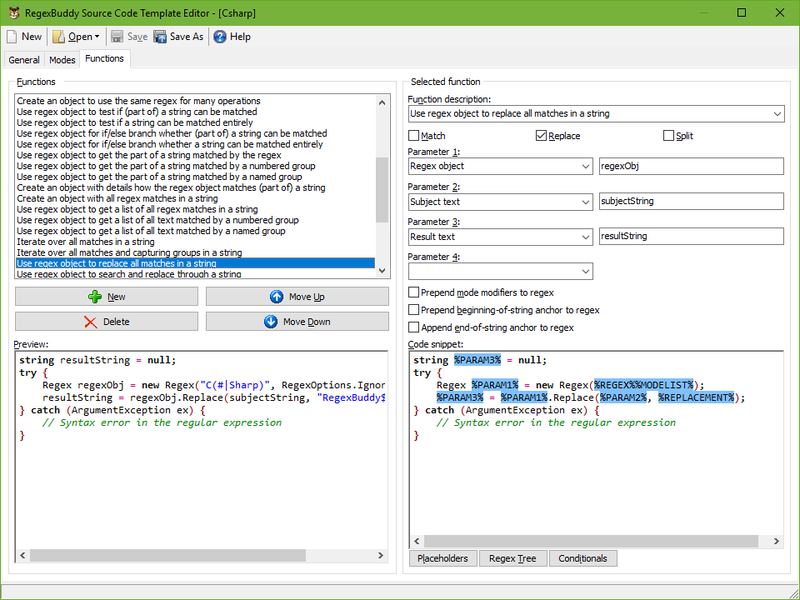 Save time and code efficiently by using regular expressions when developing applications and scripts. With the proper regex, you can often do in a single line of code, or a few lines of code, what would otherwise require dozens or hundreds. Just as you can easily create and safely test regular expressions with RegexBuddy, use RegexBuddy's handy code snippets to instantly use the regular expressions in your source code. Anything can be done: testing a string for a match, extracting search matches, validating input, search-and-replace, splitting a string, querying databases, etc. Each regular expression engine has its own regular expression flavor. They all differ in the features they support and the syntax they use. Differences between modern flavors are subtle and sometimes confusing. Older flavors often lack features that have become standard. RegexBuddy has the unique ability to emulate the specific flavor used by all the programming languages it supports. You don't have to worry you'll get different results in your actual program than in RegexBuddy. If you copy a regex from another programming language, you can make it work in your own simply by having RegexBuddy convert your regex from its original flavor to your language's regex flavor. Each regex library uses a different class structure, different function calls, etc. And each programming language has different syntax rules for strings and regex operators. The regex \\ matches a single backslash. In Perl, this becomes the operator /\\/. In Java, this becomes the string "\\\\". In Java, the Pattern class stores a regex, while the Matcher class does the work and stores results. 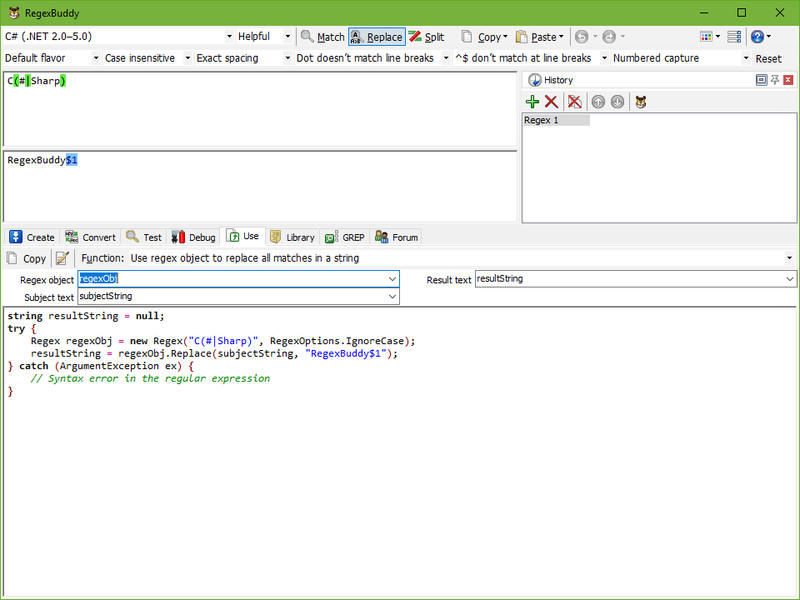 In .NET, the Regex class stores the regex and does the work, while the Match class stores the results. You get the picture. If the provided source code snippets don't support your coding style, use the built-in template editor to edit the snippets RegexBuddy generates. You can add as many templates as you like to create snippets for everything you do with regular expressions in your applications. You can even create whole new templates for other languages not supported by RegexBuddy. This is perfect for using regular expressions with in-house tools and scripting solutions. As long as your language uses a regex flavor that is already supported by RegexBuddy, your custom source code templates will be just as functional as the templates that are included with RegexBuddy. "I would like to thank you for a terrific product. The very first time I really needed to use regular expressions, RegexBuddy saved me hours of work. Plus, the code using regular expressions is far more elegant than doing it with standard string find and replace routines."